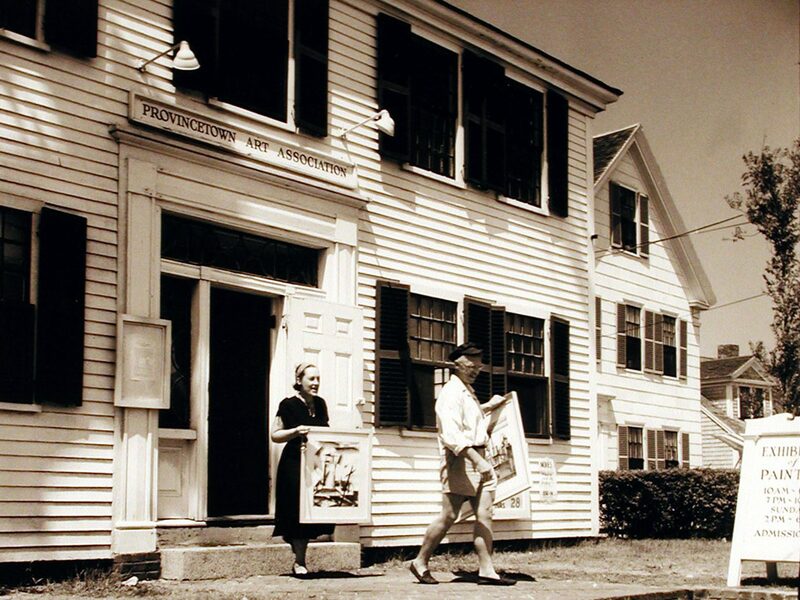 PAAM is located on Commercial Street, Provincetown’s “Main Street”, in the East End between Cook Street and Bangs Street. Commercial Street is one-way heading West, while Bradford Street, the next street over, is two-way. Please note that Provincetown permits two-way bike traffic on Commercial Street, and during busy months there is a large amount of foot traffic, so drivers need to exercise caution. There are some free parking spots on Commercial and Bradford Street (most, but not all, perpendicular side streets are for residents only), but they fill up quickly and are subject to winter weather parking bans and summer street sweeping. The most convenient option for most people is one of the many parking lots available in town. There is one handicap-accessible parking spot located in front of PAAM. Commercial Street measures approximately 3-miles long, so one is never especially far from any destination, and there are numerous cab and pedi-cab companies in town to assist those who’d rather not complete their entire voyage by foot. For more information on parking, please return to the Visit page. From Boston take I-93 South to Exit 7/Route 3 towards Braintree-Cape Cod. Follow Route 3, crossing Sagamore Bridge, to Route 6E to Provincetown. From Route 6E, take the first left exit onto Snail Road, then turn right when you get to the bay. When the road forks, bear left onto Commercial Street. PAAM is located at 460 Commercial Street, on your right between Cook Street and Bangs Street. Parking is available at private and public lots and in designated areas along Commercial Street. No parking is available on site at PAAM, with the exception of 3 handicapped-accessible spots. However, there are often spaces open in front of the Museum on Commercial Street, on nearby side streets, or in private lots located less than 3 blocks from the Museum. There are several dining options within walking distance of PAAM.